WYSIWYG Web Builder 8 (or What-You-See-Is-What-You-Get) is just that. But just because you don't need to know how to write code, don't think that you'll be able to jump into Web Builder with no knowledge of how Web pages work: You'll be doing some homework, especially to unlock the more advanced features of Web Builder. Change the look of any of your components in WYSIWYG Web Builder using the handy rightside Properties. Web Builder's UI is a little overwhelming. The Toolbox contains drop down boxes that contain the tools to manage eleven different components of your design: Standard, Images, Form Controls, Media, Advanced, Navigation, Drawing, PayPal eCommerce, Login, Content Management System, and jQuery UI. Once you have a handle on where all the tool are within the Toolbox, Web Builder is not difficult to use to design a simple site from scratch; but it's not entirely easy either. Use Web Builder's Shape, Polygon, or Curved Closed tools to draw your background components; add text art, clip art, curves, and lines, all found nested within the Drawing area. Add text, bulleted lists, tables, and more from the Standard area; and add and manage your images through Images. Although each drop down area includes a Pointer, or selector tool, you don't need to choose the pointer in the correct area (Images, for example) to select the component. Web Builder does have a built-in image editor that enables you to make minor adjustments to your images. I had difficulty resizing images while keeping the same size ratio (holding shift only constrains in one direction), and didn't find the image editor great, so would recommend using a real image editor like Adobe Photoshop CS5 ($700), or the more affordable MAGIX Photo Designer or GIMP (both free), if your site is image-heavy. There are no drag-and-drop design features in WYSIWYG Web Builder--buttons, widgets, color themes, etc.--like there are in Xara Web Designer MX 8 (also $50). However, Web Builder does include drag-and-drop navigation--tabs, nav bars, menu bars, to name a few--that are customizable. Web Builder's templates are not so much jumping-in points as they are ideas. They include only the home page design, and many of the layouts are not adaptable beyond changing text. If you want a WYSIWYG web design program that will set you up with a template you can fully adapt--changing images, text, color, location of objects, etc.--try Xara Web Designer MX 8 ($50). Once you begin looking at adding advanced features to your site, Web Builder is not always intuitive for a beginner. Adding things like rollovers and popups will take a few tries and can get frustrating. If you are looking for a program to easily add these features, try Site Spinner ($50), another WYSIWYG website design program. Specialized advanced features are where Web Builder outshines the competition: If you need the ability to build a CMS database, eCommerce site, or jQuery, Web Builder can help. There doesn't seem to be any advanced feature that Web Builder doesn't promise: Create a blog, design a form, add a captcha, collect donations, password protect your site; if you have the patience to figure out how. Fortunately, Web Builder's online tutorials are very complete and include both written and some video instruction. Unfortunately, some of the instructions are incorrect or refer to a previous version of Web Builder: For example you cannot setup guide borders, rulers and grid through the Layout > Guide Settings menu, since that menu doesn't exist in WYSIWYG Web Builder 8. WYSIWYG Web Builder is an extremely complete program for anyone seriously interested in web design. The UI is confusing, and it's hard to learn, but once you figure it out, you can put together very professional web pages with advanced features with relative ease, and of course WYSIWYG. For someone who's looking for more design help, or a real novice, Web Builder may not be the best choice, but if you're are technically adept (or willing to spend some time in the WYSIWYG help forum) Web Builder 8 is worth a look. 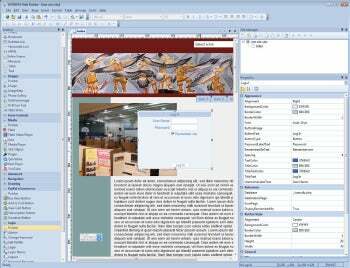 With a learning curve, WYSIWYG Web Builder can create eCommerce sites, CMS databases, and more.